Published in Megabuyte, November 2012. Original article here (£). It must be good to be Martin Leuw these days. Looking back, he has a decade of overseeing IRIS as its annual revenues grew from £9m to £120m in 2011, making it one of the UK’s biggest private software groups. This is a pretty decent CV to flaunt around as Leuw decides what he wants to do next. “My canvas is gradually being filled up,” he says as we are discussing his various projects, of which there are many – but it’s clear the businessman is excited by the relative freedom he is currently enjoying. But back to leaving IRIS. Leuw is only 50, so does the fact that he’s not looking to be CEO again mean there is a limit to how many times you want such an undertaking? After all, raising a family is rewarding, but maybe once is enough? Leuw laughs, before conceding it takes a lot out of you emotionally to grow a company from 100 to 1200 people. “The big challenge wasn’t moving from one business to another, but from one business to nothing. When I left IRIS I thought, ‘Now what do I do?’ It was like starting with a blank canvas, having a rough idea what you want your painting to look like but not having put in the details,” says Leuw, who is learning to paint and draw. “My aim is to spend, very roughly, a third of seven days on office and business activities, a third on charitable activities and philanthropy, and a third on leisure.” The latter is the purpose of Leuw’s upcoming trip to China, one of many things he’s always wanted to do but never had time for. “The big, big lesson for me was about people. If I look back, quite often when you’re growing a business it’s very easy to fall into the trap of taking on people who are good at the time but don’t have the capacity to grow. […] I’m a very strong advocate of developing people and teams, but at the senior level it has to be people with the capability to take the business forward,” says Leuw, who recently spoke at a conference where most of the 100 CEOs present conceded to having significant weaknesses within the senior management, but practically no one had plans for how to fix it. The key to thriving as a privately-backed company is choosing carefully who your backers are, emphasises Leuw. “At IRIS we didn’t say, ‘Who is going to pay the most money?’. We focused on which investors would work well with us, and add the most value. Obviously price came into it, but we wanted to ensure we would have investors to take us on the next phase of our journey. It’s a bit like a dating agency. You’re meeting different investors and you’ve got to decide: Is the chemistry right? What kind of investor are they? Are they hands off? Hands on? Do they have sector experience? Would they add value? Have they got deeper pockets to provide follow-on investment?” Not to mention how they had behaved with previous companies, especially at the point of exit, adds Leuw, who’d collect numerous references to answer this question. Posted on 11/02/2012 by Jess. 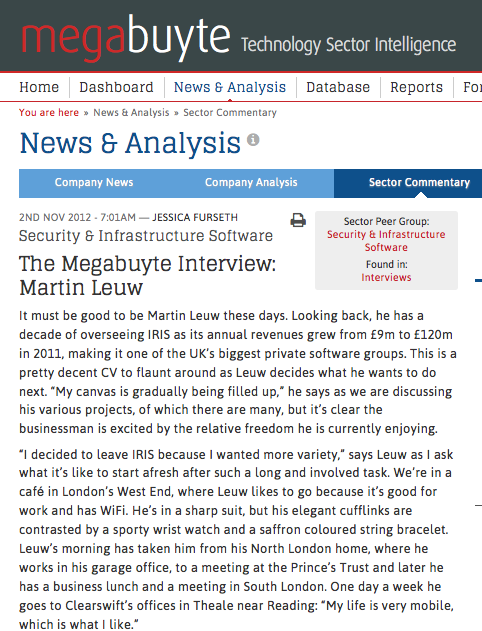 This entry was posted in Business features and tagged Martin Leuw. Bookmark the permalink.